Our daughter won a goldfish at a county fair two years ago and remarkably it was still alive at Christmas. As her parents we decided that she was mature enough to have a tropical tank as her Christmas present. For five months now my daughter and I have been hard at work creating a tropical fish tank of community fish. In a very tangible way this experiment in creating a tropical tank has my daughter and I discussing how to start a community, what makes up a good community, and how it can sustain itself. The first step of creating anything, is coming face to face with nothing. Unlike typical Christmas toys that you open and begin to play with right away, what sat in front of our daughter was a 30 gallon square tank with nothing inside it. We all looked at that empty tank and began to fill it with our expectations of what it would be. Our imaginations flourished with ideas of a tank that would entertain our family. Our son imagined miniature sharks swimming around the tank. I imagined graceful angelfish darting here and there. Our daughter imagined schools of neon tetras moving about the tank in formation. There would be live plants and the water would always be crystal clear. Creating a Tropical Fish Tank is a lesson in Creating Sustainable Communities. If we had magical powers, we would have blinked our eyes and that imaginary tank would have appeared before us and soon that tank would have become a place of carnage and destruction. The angelfish would have terrorized the neon tetras stressing them out and they would begin to die. The sharks would have eaten the angelfish for dinner. What we hoped for was not possible; angelfish, sharks, and neon tetras do not play well together. We had to be more thoughtful about who we welcomed into our new community. We gathered some basic information about who plays well together and what kind of environment each fish needed to thrive. 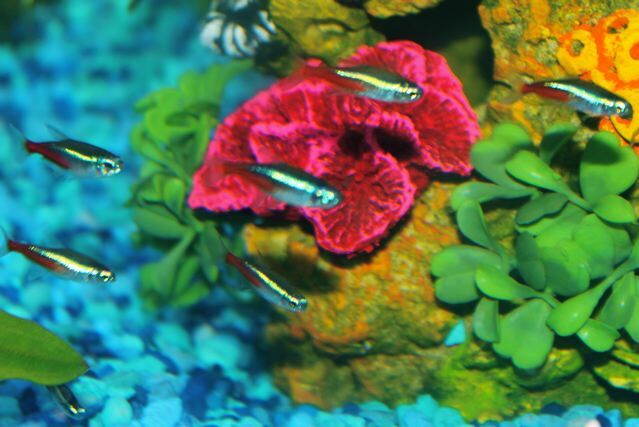 Neon Tetras, while beautiful, are sensitive fish and require patience when building the community. We had to wait for a week while the aquarium water cycled before we could introduce any fish. In the meantime, my daughter began reading up on which fish would start the tank off well. Ones that were hearty and could withstand a great deal of stress were the best choices as first fish. She had wanted neon tetras, but she discovered that they are too sensitive and would die in an unstable environment. So she began her community with 2 platties and 2 mollies. Little did she know that the female molly was pregnant and soon would give birth to one little fish, a “fry” and then the mom died. So we now had a baby to worry about and a dead fish to take care of. Even as we proceeded with caution, there were unexpected blessings and challenges. We learned patience as the water and the fish began to establish the necessary bacteria required to create a sustainable environment for a tropical fish community. We eventually added another female molly to the tank because we thought the male molly was lonely. Slowly we added beautiful tetras. Even under careful watch, many water tests, and loads of research, we still lost several tetras as we built our school of fish. We had setback after setback, but we remained steadfast to our commitment of creating a sustainable community. 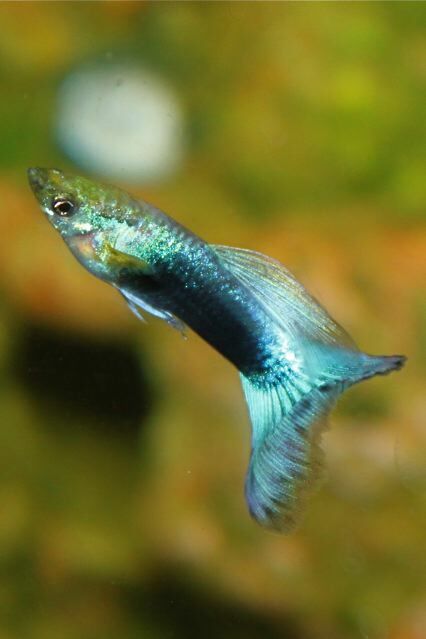 Guppies are community fish that play well with others. One day we were especially concerned when an orange residue began to form on all the decorations. We were worried we would experience more loss. So we took in a water sample and it tested perfectly—everything was in balance. In fact, what happened is our water had begun to grow algae—a sign of new life! We did not know what new life would look like, so when it showed up we were worried. 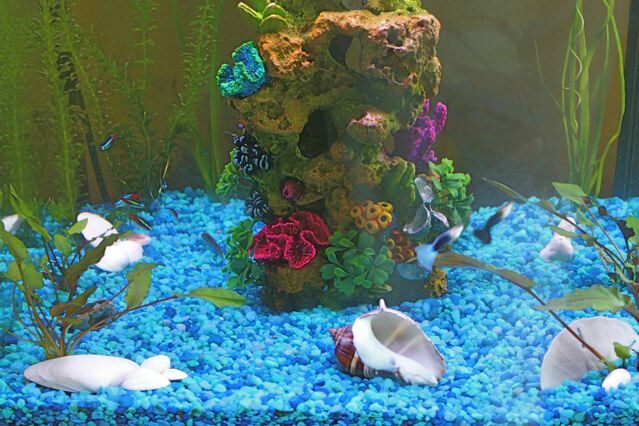 To keep the algae in check, we brought home a new fish, an algae eater, and two mystery snails. The tank was sparkling clear in two days. We have since added a dwarf frog, zebra danios, and colorful guppies—all fish that will play well together in a community tank. If in the future we want miniature sharks or angelfish, they will need their own separate tanks. I wish I could say that all is well and our tank is filled with crystal clear water after 5 months. But I can’t. I can say we have two litters of baby mollies and lots of baby snails crawling about. We learned how to treat for a fish disease called “ick”. Sadly, that treatment killed our dominant male molly and more than half of our tetra school died as well. We learned to keep trying, keep testing the water, and keep talking to the experts about how to proceed. What is the nature of the ecosystem that I am entering? What are the elements that make it what it is? What is the vision for this new community and how will it contribute to the common good and “Shalom” of our world? How is my presence going to impact the community for better and worse? Who are the heartiest people to bring into the community first? Who will play well together? What would new life look like? Would I recognize it if I saw it? How can I view challenges as opportunities for growth and learning? 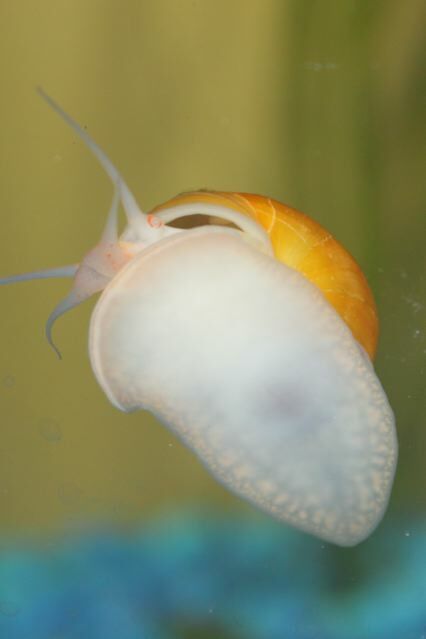 Mystery snails help keep the tank clean, they also reproduce quickly. This journey of creating a community has been spiritually enlightening. I have thought a lot about the creation story in Genesis 1. It is no wonder that animals and human beings were not put on the earth on the first day. There would have been no environment, no ecosystem in which for them to live. First God built the environment that would sustain life, then God put the life within it. Spring tulips blooming in a community of new of life. I invite you to explore the communities and ecosystems around you. 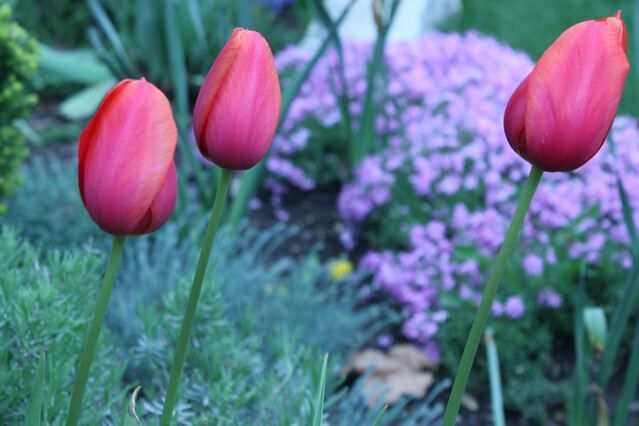 Notice how the tulip does not live on its own, but in the good earth, during the cool spring days after the winter-freeze is over. 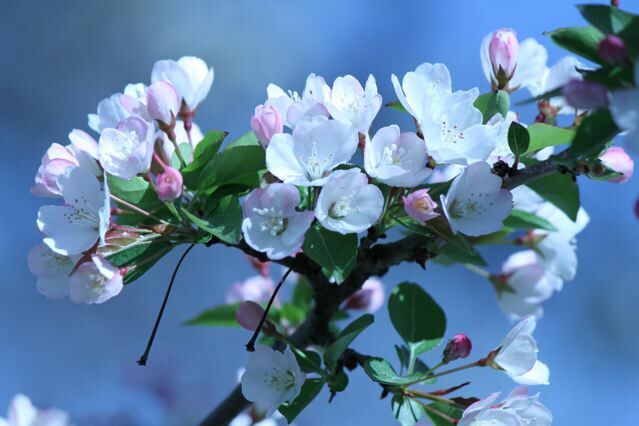 Pay attention to the timing of God’s seasons, how the tomatoes of August need the warm soil of May and the pollinating bees of summer to bring forth the fruit of the earth. You also require a community and a healthy environment in which to flourish. If you are flourishing, look for ways to thank the people in your community who create and sustain the environment around you. If you are not flourishing, perhaps the ecosystem is out of balance—what would bring new life and balance into your community? May we each take the time to create healthy flourishing communities around us. And when we experience setbacks, may we have patience, understanding and perseverance to continue to care for the whole community, and ourselves within it. Thoughtful and well written. My experience has been that when I make positive changes in my lifestyle and then convey that change to others, it spreads the same “positivity”, be that hope, tranquility or resilience to deal with lifes adversities. May I wish that the stream of life be always bright and sparkling as it winds its way through your lovely home. I love how the fish community is such an illustration of all it takes to create a community. Two years ago we joined Couples Coaching Couples (CCC) in the NY-NJ area and we’ve watched our friendship/support community blossom. A year ago we took on a leadership role in our Circle along with several other couples. We didn’t know how that would look, much like when your daughter confronted that empty aquarium. As we planned our quarterly meetings, our team tried this and tried that, with good success. We continued to introduce new couples to CCC and as we expanded our Circle, we also came up against couples leaving the Circle. Much like losing the tetras, we had to confront their loss. Our diligence had not been sufficient and we had to be willing to accept judgment errors on our part. Our community now continues to flourish – things are in sync. When this community began several years ago, it did not always look like it would work out, but the commitment to keep going, learn from the past, while being willing to venture into new territory has made the difference. Kudos to you and your daughter for having that vision and perseverance to create a community for these lucky fish!